allows stable refrigerant control, protects the compressors, and monitors air exhausted by compressors, avoiding faults of compressors. High Efficiency-The “Apollo”/“Apollo+” stands for high efficiency/ extremely high efficiency on partial and full load operation , thanks to dual screw compressor , sub-cooling design , M shape condenser ,economizer , shell and tube evaporator ,electronic expansion valve and patent aerofoil aluminum fan . Capacity Continuous Adjustment -With intelligent controller , EK chiller performs a prompt adjustment according to system load to ensure the precisely chilled water temperature . What’s more , it will unload automatically at extremely high ambient temperature to protect compressor. 10.1” Touch Screen -is directly connected to the microprocessor , providing monitoring history data recording ,safety protection ,and more convenient operation . Widely Applications -EKAS is the idea solution for commercial building & industrial applications that required high performance ,continuous operation , lower operation and maintenance cost . BMS (Optional)-EK provide an RS485 standard communication interface , which is more convenient to joint with building management system . Standard protocol includes BacNet ,Modbus and Lonwork . 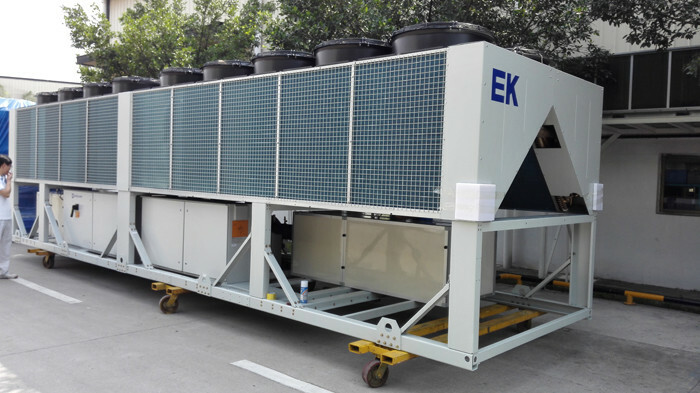 Chiller Manage System (Optional)- EK provide intelligent CMS for centralized control on several air cooled screw chillers to balance each unit running time ,and perform automatically switchover on a fault unit , ensuring the whole system stable running & energy saving .